It's been kind of slow on the reading front lately. I don't seem to have the time, but when I stop to think of it, I can't figure out what's taking up my time instead? 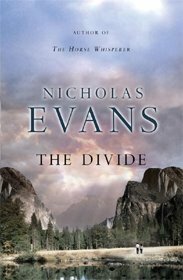 Anyway, I got real excited when I saw The Divide by Nicholas Evans in the library. I've loved his other three books and got all ready for a really good, quick read. But it seemed to take forever. His previous books have all played on my emotions somehow, and I know I cry easily but I seemed to always cry bucketloads when reading his books. I'm not saying this wasn't a good book, I did enjoy it, but it didn't grip me as totally and it didn't make me cry. He's taken his nature theme in a completely different direction this time. It was sad to read of this family seemingly falling apart and I think he got the family's little quirks down pretty well. Still a good read, but not what I was expecting. I've always been slow on the reading front. I enjoy it. It just usually takes me a long time to finish a book. I remember as a kid I would often have to re-read sentences in order to understand them better. I think it's because I would read aloud and just liked to hear my own voice while disregarding the content altogether.